Self-driving cars are the future, and Nvidia wants in. CEO Jen-Hsun Huang announced today at the inaugural GPU Technology Conference Europe that the company is developing a simplified supercomputer that can power self-driving cars. The supercomputer, called Xavier, is a system-on-chip (SoC) design that features both CPU and GPU on a single chip. Nvidia worked hard to shrink the silicon down to minimize space and maximize efficiency. Xavier features eight Nvidia CPUs and 512 CUDA Cores. It's those CUDA Cores that allow a specialized programming language to leverage the GPU to perform tasks with greater performance, which are needed for the complex systems in a self-driving car. The chip includes a pair of 8K resolution video processors to help chew threw video feeds from a self-driving car's camera system. Nvidia's Xavier supercomputer can perform 20 trillion operations per second while only consuming 20 watts of power. For reference, Nvidia's previous self-driving car chip, the DRIVE PX2 used in Volvo's fleet of self-driving XC90 SUVs, is capable of the same 20 trillion operations per second, but is more than twice as big and requires 250 watts of power. 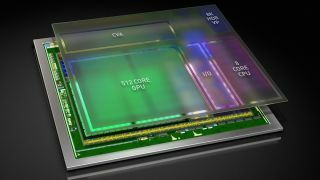 While Nvidia is most known for its graphics cards, the company has experimented with bringing its chips to cars for some time now. The Tesla Model S features a head unit that's powered by Nvidia chips, and today Nvidia announced that it partnered with navigation company TomTom to provide real-time localized mapping data for cars. The Xavier supercomputer may have been teased today, but it'll be a year before samples even begin shipping to automakers and research institutions. Though it will still be some time before we see Nvidia-powered self-driving cars on the road, the groundwork is being laid now. Self-driving cars are a long-term bet for Nvidia, but the investment in automotive technology shows the company is serious about powering the automotive industry into the future.